Home / Blog / After arduous preparation for a year, the Amendments to the Animal Protection Act (APA) will be proposed on October 1, 2013! 1. The result of a beautiful collaboration! Providing direction for our nation’s APA! 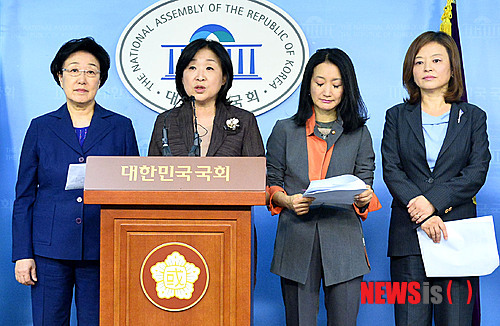 After a year-long preparation, amendments to the APA will be proposed at the National Assembly on September 26, 2013. This proposed amendment is the result of a lot of hard work and sweat from many organizations. 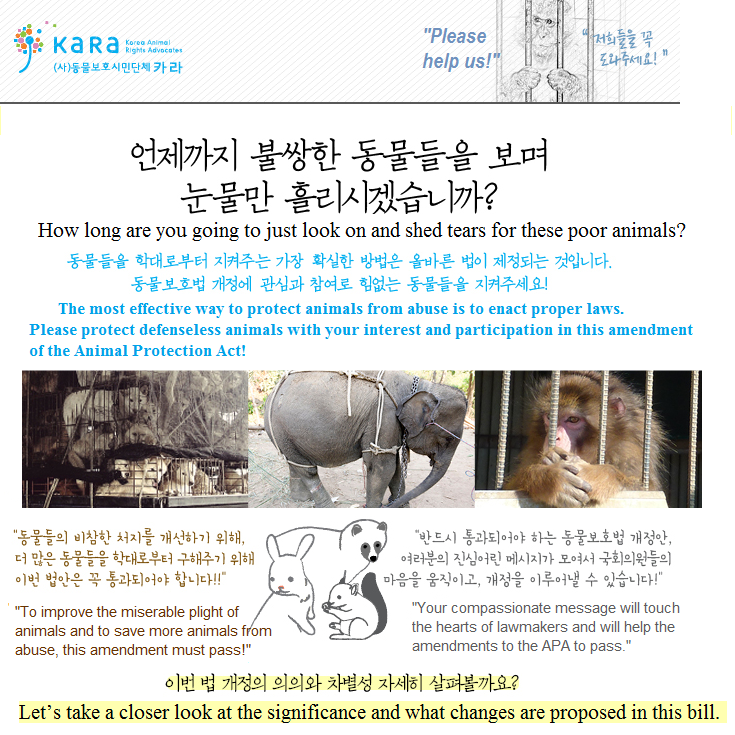 The Attorneys’ Network for Animals and Korea Animal Rights Advocates (KARA)conducted APA research meetings. Five sessions of the National Assembly panel discussions co-sponsored by KARA/Green Party/lawmakers and the working level/promotion committee meetings that included experts from various fields were held. While drafting this amendment with the Attorneys’ Network for Animals as leads, we reviewed the history of the amendments to our APA and also extensively referenced the APA of other countries. To draft a bill that takes current reality into consideration and provides the necessary protection and welfare regulations, we analyzed recent animal cruelty cases to identify areas of laws that need change, even referencing child welfare acts. At the last panel discussion meeting in April, a panelist who has been monitoring the history of the enactment and the amendments of APA said, “This is the most beautiful amendment I have ever seen so far. Even if not all the provisions in this bill pass, this bill has a great significance in that it provides a direction for our nation’s APA to move forward.” This encouragement became a big source of strength for us. 2. This amendment to the APA is our nation’s first joint initiative that transcends political parties! 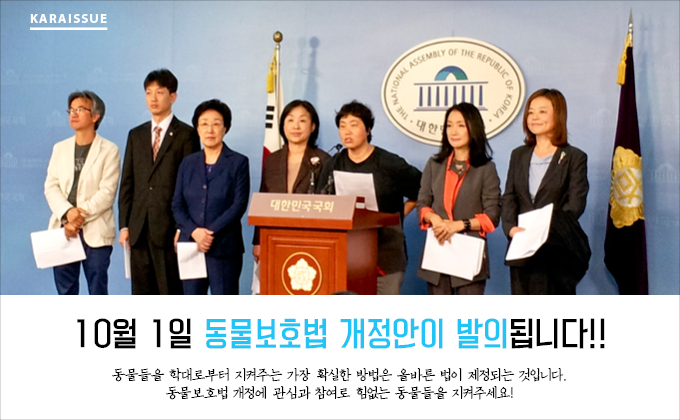 We are deeply grateful to the national assembly members, Jeong-Lim Moon (Saenuri party), Sang-Jeong Sim (Justice Party), Sun-Mi Jin (Democratic Party) and Myung-Sook Han (Democratic Party), who for the first time in our nation’s history have transcended political parties to sponsor this amendment to the APA. We are also truly appreciative of the many lawmakers who have co-sponsored this bill. Furthermore, we are indebted to the Green party and their office, speakers and panelists, APA reform committee members and advisers who participated in the five panel discussions. But most of all, we are deeply grateful to the Attorneys’ Network for Animals for their year-long hard work and research, and the great sacrifices they made, even putting their own livelihoods aside to draft this amendment. As a result of the shared noble common goals and the beautiful cooperation of all, we were able to achieve a remarkable joint initiative that transcended all political lines. Prior to the completion of our bill starting around the end of last year, several lawmakers proposed partial amendments to the APA and were successful in passing some of the provisions that are similar to what we have been working on. We would like to take this opportunity to thank them as well. What will change if this bill passes? All provisions of the bill are important. We will first divide them into ten categories and introduce them here. Let’s take a look at the contents of the amendment. 1. The name of the law will change from ‘Animal Protection Act’ to ‘Animal Welfare Act’!! The new name ‘Animal Welfare Act’ carries our hope that we will go beyond just protection to provide animals with a better living environment with greater assurance for their right to live. Animal Welfare Act will not only protect animals from abuse, it will also provide a foundation that will allow for more provisions to prevent cruelty to animals by increasing the level of standards of welfare. This law is based on the principle of human responsibility towards animals (Amendment Article 1 Section 1). Accordingly, this bill proposes new mandatory provisions as well as raising the level of existing ones from ‘recommended’ to ‘mandatory’. This bill addresses the animals’ basic needs and the responsibilities of the nation and its local governments to meet their needs. The basic principles of animal protection becomes mandatory. Establishment of national plans to protect animals in case of a large-scale disaster becomes mandatory. Creating suitable environment to maintain the health of animals becomes mandatory. Codes of compliance during transport of animals becomes mandatory. Local governments must investigate and prosecute animal abuse cases. Local governments and law enforcement agencies must dispatch agents to the scenes of animal cruelty and conduct investigations. Animals used for testing must be protected from unnecessary suffering and diseases. Ethics committees must be notified of any animal experiments that violate ethical principles and the committees must investigate these cases. Farm animal breeding environments must be created with the consideration of the animals’ welfare. Animal protection inspectors must respond to animal abuse cases. More animals will be protected by law! The new bill opens up the possibility to protect not only all vertebrates with a developed nervous system capable of feeling pain, but even the invertebrates. Research study shows that invertebrate animals can also feel pain. Article 8 of the current APA (Prohibition of cruelty to animals, etc.) becomes significantly strengthened, refined, and departmentalized. Through these changes, the cruel abuses from which the companion animals, stray cats, and the animals that live around us suffer can be prevented and punished. The definition and the range of animal abuse will be expanded to include treating negligence and neglect as the same as direct animal abandonment. Frequent transporting of animals from place to place and forcing human contact on them or for the use of them for exhibitions such as mobile zoos. Training animals to become aggressive or testing their aggressiveness using other animals as bait. Offering animals as prizes or giveaways for gambling • entertainment • lottery • competition, etc. The provisions below do not exist in current law. However, in order to protect animals from their abusers, they are absolutely necessary as well as the ‘prohibition of cruelty to animals’ provisions. Allow the emergency quarantine of animals from abusers when there is no time to wait for the police to arrive at the scene and the local governments must care for the animals in quarantine. An animal abuser cannot claim ownership of the abused animal. Animal abusers cannot request the return of abused animals while an investigation or trial is in progress. In order to prevent the recurrence of abuse, the animal is to be confiscated and taken away from the abuser. Animal abusers must be restricted from owning animals or working in professions involving animals. This bill is particularly significant in that it provides direction and basic principles for farm animals and for those used in testing. These will be the cornerstone that can lead to more improved amendments in the future. As a life being, animals used in testing should be treated ethically • humanely, and should not merely be considered as a tool for experiments. Animal testing must be minimized and the principles of “minimization of animal testing that inflicts pain” and “the minimization of pain” are also added. Animal testers must assure the welfare of animals used for testing by specifying the measures to be taken for the welfare of animals and by supporting the development of alternative methods to animal testing. From the test planning stage, animal testers must submit a test plan that takes animals’ welfare into consideration to the ethics committee for their review. Animal testing ethics committees must report any unethical animal testing to the Ministry of Agriculture, Food and Rural Affairs and the Minister must investigate violations without delay. The provisions regarding ‘the certification of animal welfare farm’ as well as the provisions improving the welfare of all farm animals is expanded. The details necessary to improve the welfare of farm animals is concretized and the basic principles for the welfare of farm animals are presented. The humane treatment of animals must be incorporated into the practices of breeding facilities, and amputations for purposes other than preventing or treating diseases must be made unlawful. We cannot overemphasize the fact that setting strict standards for businesses dealing with animals is the starting point of protecting animals. In addition to the current standards for animal cemeteries, sales, importation, and breeding, the new bill requires animal transportation and training services to include the necessary facilities and personnel. Because the welfare of animals must be considered a top priority in the process of breeding and in the selling of them to the end customers, all businesses involved must be registered. Based on the severity of the punishment imposed for animal cruelty convictions, the time period banning the operation of the offending business increases to 2-5 years. In order to prevent irresponsible transactions of buying and selling animals that treat the animals as if they were objects, selling animals to children under 14 years of age not accompanied by a guardian and communications •telemarketing solicitation will be banned. Public-private cooperation is essential for today’s animal protection. If animal protection inspectors and honorary inspectors can perform their duties effectively, the reality of our nation’s animal protection can vastly improve. To help inspectors perform their duties properly and sharpen their knowledge related to their duty of animal protection and welfare, annual training of animal protection inspectors will be required. Animal protection inspectors must take measures to rescue, protect, and quarantine abused animals. Specific, concrete information about animal care centers and animal welfare farms, information about the responsibilities of animal protection inspectors and honorary inspectors must be published regularly. 10. More severe penalties. Prevention of animal abuse, education and even rehabilitation of animal abusers! This bill increases the severity of all penalties related to the ‘prohibition of cruelty to animals’ provisions. It also proposes to create joint penal provisions that hold not only individuals but also their organizations responsible. Furthermore, it seeks to educate and rehabilitate to prevent recurrence. Please send thank you messages to the sponsors of this legislation and strong messages urging its passage to the Agricultural and Livestock Committee of the National Assembly! Please share this information with as many people as you can so that more people can help to pass this legislation! There are issues that are not included in this bill because of the barrier of reality or in order to approach it with other laws. These issues include the complete ban of using animals for fighting, and the banning of and the regulation of painful and unnecessary animal testing for cosmetics.Provisions for the dog meat ban are also not included in this bill. However, if we can significantly strengthen the provisions to prohibit animal cruelty and increase the standards of animal welfare through the passing of this bill, then we will get closer to the substantive ban of dog farms and be able to bring forward the complete ban of dog meat trade. Improvements to the APA and related laws can grow through your continued interests and petitions! Click this button to see the email addresses and sample letters. PLEASE STOP ABUSE & ANIMAL CRUELTY!!!!!!!! PLEASE BAN DOG & CAT MEAT TRADE NOW!!!! PLEASE SHOW LOVE TO ADOPT DOGS AND CATS NEW HOME NOW NOW NOW NOW! PLEASE SHUT DOWN DOG & CAT MEAT TRADE AND FARMS NOW NOW NOW NOW PLEASE ARREST BAD OWNERS AND WORKERS TO GO TO JAIL FOR A LONG TIME AND BIG FINES NOW NOW NOW NOW!!!! WE LOVE INNOCENT SWEET SMART DOGS AND CATS ARE GIFT FROM GOD!!!!!!!! Please do the right and humane thing. These animals are loving companion animals, not livestock. They are also kept in such dirty conditions that they are unsafe to eat. THIS IS BARBARISM AND THE WORK OF DEMON FILLED SAVAGES, GOD IS WATCHING YOU YOUR DAY OF DEATH YOU WILL STAND BEFORE GOD ALMIGHTY THE CREATOR OF ALL CREATION, YOUR JUDGEMENT WILL BE ETERNAL HELL, YOUR HELL WILL COME, THE WICKED WILL BE CAST INTO HELL AND ALL THE NATIONS THAT FORGET GOD. THESE ANIMALS ARE PURE SOULS YOUR PERVERTED DEMONIC TRADITIONS AND BELIEFS HAVE NO TRUTH OR VALIDITY. WHAT SANE HUMAN CAN GET UP EVERYDAY TO KILL AN INNOCENT LOVING FLESH AND BLOOD CREATION OF GOD. REMEMBER HELL IS ETERNAL AND YOUR DAY WILL COME. STOP ANIMAL ABUSE!! STOP ANIMAL CRUELTY!!! Penalties are directly related to the provisions for ‘prohibition of cruelty to animals’ which are mentioned above and this bill raises the severity of penalties across the board. Creation of joint penal provisions that holds not only individuals but also their organizations responsible is proposed and education and rehabilitation to prevent recurrence is to be provided at the same time. Please send thank you messages to the sponsors of this legislation and strong messages urging passage of this legislation to the Agricultural and Livestock Committee of the National Assembly! Please share this information with as many people as you can so that more people can help to pass this legislation! There are issues that are not included in this bill because of the barrier of reality or in order to approach it with other laws. These issues include complete ban of using animals for fighting, ban or regulation of animal testing that is unnecessary or inflict extreme pain such as animal testing for cosmetics. Provisions for dog meat ban is also not included in this bill but if we can significantly strengthened the provisions to prohibit animal cruelty and increase the standard of animal welfare through passing of this bill, then we will get closer to the substantive ban of dog farms and be able to bring forward the complete ban of dog meat trade. Encouraged by your interests and petitions, improvement of APA and related laws can continue! Животным необходима защита! Надо прекратить зверства. Stopt endlich das barbarische töten dieser Hunde. Dieses Volk hat einfach keine Tierliebe nur ihren Wahn. Abscheulich u tiefste Verachtung ….Einfach primitiv u schwach solche wehrlosen Hunde si zu quäulen. Please…please…please World…… Stop cruelty abuse and barbaric of Dog’s and Cat’s and otter animal’s…..whats waits we for?????? What you sow so shall you reap if not in this world hell hopefully will get you who cause or allow vile cruelty to human or animals life. God, how can You stand seeing this horror for animals? Koreans – shame of all mankind!!! Show compassion! I will never visit a country that does not protect animals. WTF??!!! karmas gonna get theses mf’rs !! Karma, just….smh.. karmas gonna get u ! all of these are a good. goal to. reach..
STOP ABUSE KOREAN DOGS AND CATS!!! End the barbaric slaughter of cats and dogs in the criminally illegal cat and dog meat trade! STOP THIS ABUSE NOW AND FREE THEM TO LOVING ADOPTABLE HOMES IMMEDIATELY!! I am infuriated looking at how this dog, a domestic animal, that global society calls their best friend, dogs and cats actually become members of our family, loved and nurtured. Do you know how this barbaric practice of your’s makes you look in this 21st century? Ignorant, I cannot even use the language here on this public site, that I wish to use to those sorry excuse for humans in that video! You must be so desensitized to the suffering of others period, doing that to animals also makes you callous to the suffering of not just animals, but humans also! All products from S. Korea, other Asian countries that carry on this practice, such a Viet Nam, Thailand, China, and the Phillipines should be boycotted! Such animal cruelty now, and white immediately waste abolished! STOP THE DOG SLAUGHTERHOUSES. YOUR COUNTRY SEEMS TO DELIGHT IN CRUELTY TO ANIMALS. i WISH I COULD EXPLAIN TO YOU HOW HORRIBLE YOU APPEAR TO OTHERS WHO FEEL YOU HAVE NO HUMANITY FOR ANIMALS. PLEASE STOP KILLING DOGS AND CATS FOR FOOD- THE DOG MEAT TRADE IS EVIL AND WRONG. TRY EATING VEGETABLES, THEY ARE DELICIOUS!!!! PLUS U WILL SLEEP WELL AT NIGHT KNOWING YOU HAVE NOT KILLED MILLIONS AND MILLIONS OF ANIMALS .. PLEASE BE HUMANE AND KIND TO ANIMALS. THANK U.
Ghandi said: The Greatness of the nation can be judged by the way its animal are treated. So ask your people to a proud nation but a Hell one! I Sincerely hope you bring in proper animal welfare laws to help the evil plight of innocent and helpless animals in your country. The United Kingdom brought forward the very first Animal welfare laws 200 years ago. These laws stopped the terrible cruelty and violence not only to animals but improved our whole of our human society. As the result of these laws other nations brought forward their own. Great humanitarians who introduced these laws went on to introduce further human welfare laws, stop slavery, bring in child schooling and protection laws. Compassion to animals slowly created compassion to all peoples in our society. The apathy, callousness and indifference to animals and people that had made the British Empire, turned into benevolence and eventually one of the most progressive and humanitarian countries in the world. You need animal welfare laws to improve the moral and ethical consciousness of People. Please stop this horrific abuse of living beings! End the madness. Retrain for humane jobs n ways to make money. Please, please stop this terrible act!!!!! ALL ANIMALS need to be treated like humans, or they will suffer as we would in the same situations.